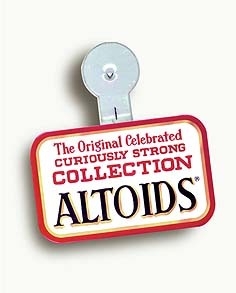 The CliffordSmith Gallery and OH+T Gallery are pleased to join forces to host the 4th Annual Altoids¨ Curiously Strong Collection on its first stop on a national tour following the unveiling at the New Museum of Contemporary Art in New York in February. At the completion of the tour, these 20 new acquisitions will join previous years' pieces in the New Museum's permanent collection. john espinosa . things you can or cannot learn from tv . 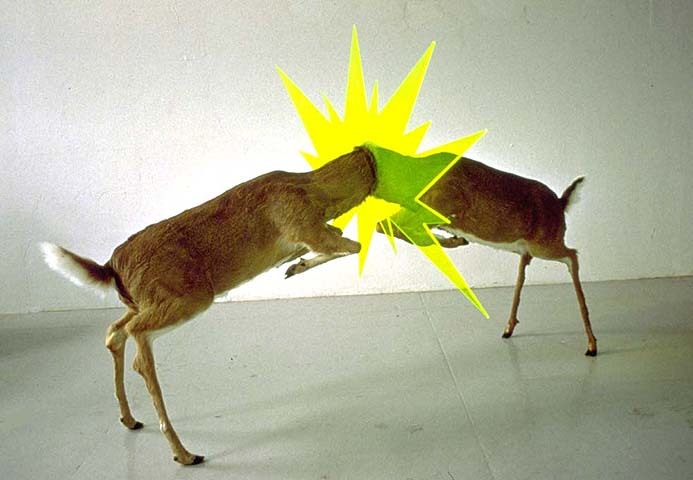 2001 . two taxidermied deer, aluminum pipe, plexiglas . dim. var. Yun Fei Ji's "Hanging Garden," a classical Chinese landscape-style painting that infuses often troubling modern urban imagery with the beauty and splendor represented in this traditional artistic genre; Shirley Tse's "Diaspora? Touristry?," part of a photographic series in which Tse juxtaposes conspicuously artificial looking sculptures made of blue bubble wrap with the vast and daunting landscapes of Utah and Colorado; and Dave Muller's "Pollock Sketchbook (Icy Landscape '52-'53)," a unique appropriation of a famous Charlie Brown cartoon about Jackson Pollock that continues Muller's examination of the structures and artifacts of the art world. sam easterson . animal, vegetable . video: oasis . (tarantula) . 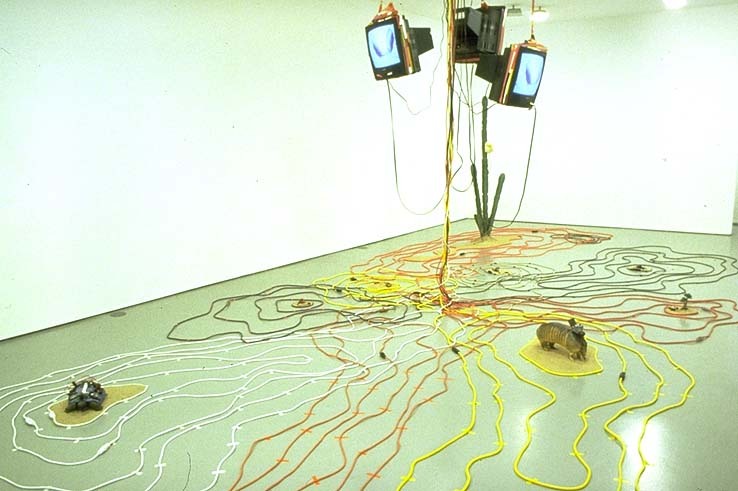 2000 mixed media . dim. var. dread scott . if white people didn't invent air . 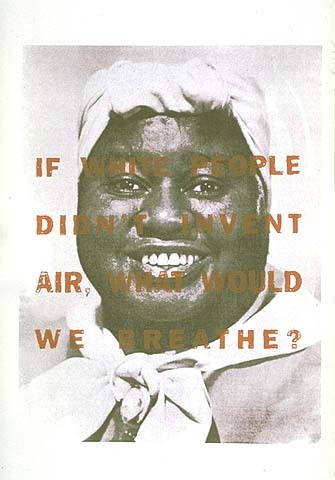 2001 . silkscreen on paper . 30" x 22"
At the completion of the Boston exhibition, the collection will travel to Maimi, Los Angeles, and San Francisco before returning to New York. The show Includes work by: Jesse Bransford, Trisha Donnelly, Sam Easterson, John Espinosa, Barnaby Furnas, Luis Gispert, Erik Hanson, Yun-Fei Ji, Brad Kahlhamer, Katrina Moorhead, Dave Muller, Shane O'Cadja Nash, Dread Scott, Ben Snead, Shirley Tse, Torbjorn Vejvi, Courtney Walker, Dan Webb, John Williams and Amir Zak. barnaby furnas . 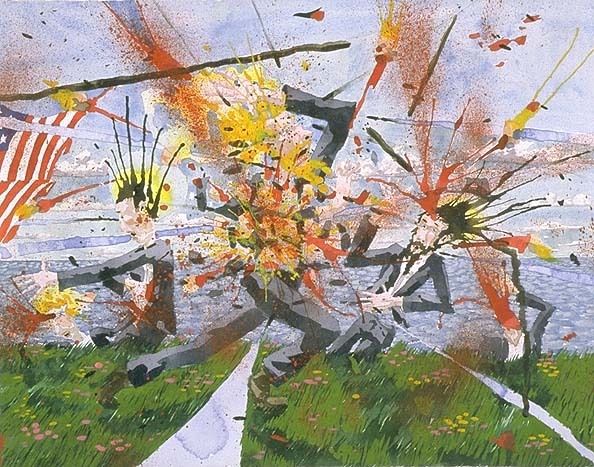 untitled battle scene . 2001. watercolor on paper . 13.75" x 17.75"